When the Toyota Prius made its debut in Japan in 1997, it held the distinction as the first mass- manufactured hybrid vehicle to ever hit dealerships. It made its worldwide debut in 2000, and it quickly became a popular choice for environmentally conscious drivers. Over the years, the Prius has made its way into over 2 million garages and driveways, and it became a popular choice for celebrities. It’s also been featured in various television shows, ranging from “South Park” to “Six Feet Under.” The Prius stands out due to its impressive fuel economy. It is also comfortable and reliable, making it a standout choice. The 2018 Prius doesn’t sacrifice technology or safety for being an eco-friendly hybrid vehicle. Though it’s a very practical vehicle, it’s still a fun and comfortable ride. The interior features the Toyota Entune Audio system, an intuitive system for your audio entertainment whether it’s Bluetooth audio streaming, SiriusXM Satellite Radio, or the traditional AM/FM radio. The Prius has many standard features and available features to add make your Prius unique to you. Don’t fall for the hybrid stereotypes, the 2018 Prius breaks all hybrid stereotypes and shows it can compete with any vehicle. With so many new things to offer drivers, it is easy to lose sight of the Prius’ rich history. To understand the Prius, you must first understand what the word means in Latin. It means “to go before,” and that is exactly what the Prius has done. The Prius proved that fuel efficiency and style can be rolled into one, and other manufacturers have been trying to catch up since the vehicle debuted in 1997. It was originally supposed to hit Japan’s dealerships in 1999, but Toyota sped up the launch so it would make its debut at the Kyoto Conference on Global Warming. The automaker realized that the Prius could become part of the conversation and the solution, so it needed to get the vehicle on car lots sooner. The first Prius went from 0-60 in 14.1 seconds and had a lower mpg, but it was just the springboard for what was to come. The automaker knew it had to give it more power before it made it to U.S. markets, so it went back to the drawing board and make some important changes. It went from 0-60 in 13 seconds flat when it hit dealerships in the United States, proving that Toyota had the innovation necessary to bring efficiency to other regions in the world. In 2012, Toyota added a plug-in model that drove on electricity alone. Then, it decided to move over to the crossover market with the Prius by adding the Prius V to the line. With 6 extra inches, it made the Prius perfect for family road trips. Today, the Prius can go 0-60 in 10.5 seconds and reaches top speeds of 114 mph. This proves that the future is bright for the Prius. 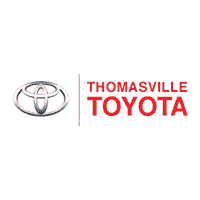 With excellent customer service, Thomasville Toyota is the obvious choice when looking for a 2017 Toyota Prius. We always put the customers first, and that sets us apart from other dealerships. Whether you come in for a new vehicle or for a repair, we will treat you as if you’re the only person at the dealership. Stop by Thomasville Toyota today and take the all-new Prius out for a spin.